Supernatural 14x01 "Stranger in a Strange Land"
Back in the saddle again, I guess! Yep, we're back to another season of Supernatural, which started with kind of an... ehhhhh, okay. In case you forgot, basically they saved a bunch of people from another world, but in order to do so, Dean had to say yes to Michael taking over his body, and so now he's still possessed by him, and Sam and the others don't know where he is, blah blah. So where is he? Just, you know, roaming around asking a bunch of people and angels and otherwise nasty things what they want. Mostly he seems to be unsatisfied with their answers, as I guess he's looking for an ally to "make a better world" in his eyes. Apparently he decides that a vampire is the right type of thing to team up with, as that's who he's teaming up with at the end of the episode. And that's about all we saw of Michael/Dean this episode! Meanwhile, Team Free Will is very much down in the dumps as it's been a few weeks and they can't find Dean or a way to get him free of Michael. 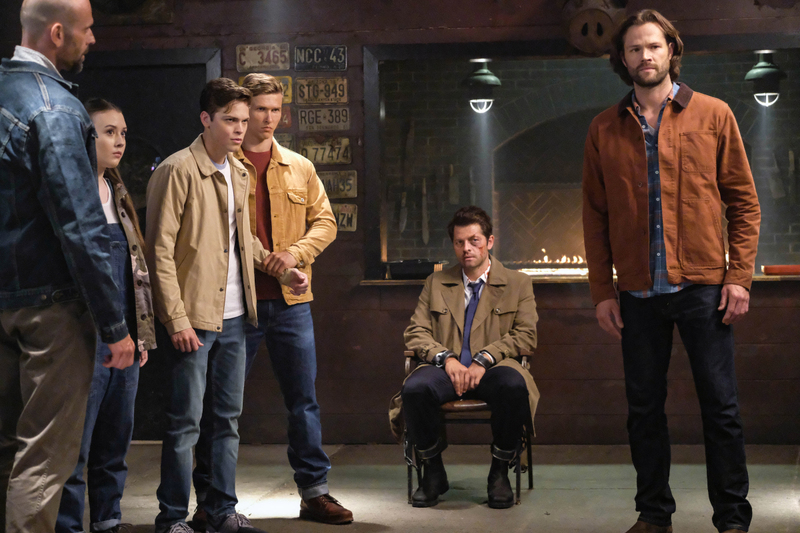 What they can find is Castiel acting a dunce bucket and getting duped by some demons, leading said demons to call up Sam to make a deal to hand over Castiel. In exchange for what, one wonders? We find that out once Sam and company arrive -- apparently this new charismatic demon named Kip wants to have the deal Crowley did. Basically, he gives Sam information and Sam looks the other way about demon dealings. Sam's in no mood for such suggestions, and so with the help of mostly Mary and Bobby, with Jack and this girl Maggie tagging along pretty much to get beat up and stuff, Sam manages to kill this Kip, and basically tells the other demons that he doesn't intend to let anyone become to new the King of Hell, and they can take it up with him if they have a problem with that. Said demons promptly smoke out of their human hosts because Sam Winchester is so scary with his depresso beard, man. Jack also does a fair bit of moping throughout the episode because his grace was drained by Lucifer and he's without powers and feels helpless. Sam and Cas try to comfort him, but what probably really comforts him is the fact that his grace should come back over time? Okay, never knew that before. Also, apparently Nick, Lucifer's host body aka Mark Pellegrino, survived getting stabbed, and somehow also made it over to this world? Did I miss that happening? 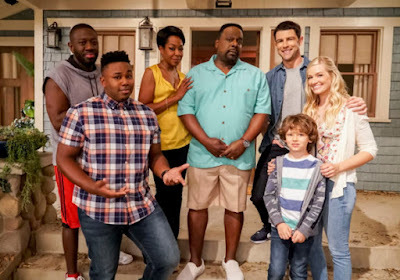 Man, guys, sometimes you just have to let characters go eventually. I mean, really. 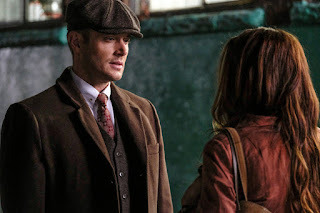 Finally, the episode ended with Anael aka Sister Jo aka the one angel we saw Michael talk to because it was probably fun for Jensen and Danneel Ackles to do a scene together again... whoa that sentence got unwieldy! Basically Anael calls up Sam at the end of the episode because she's not too happy about this new Michael being around. Dun dun dun! - Way to go, CW, with spoiling that Lucifer aka Nick was going to be around in the commercial before it actually happened! - What do people think of Jensen playing Michael for a bit? - I actually liked that demon character, Kip, so boo hoo for me that he got killed off so quickly. - Classic episode of Supes just waiting around with not much actually happening. Jamil: What do you want? Michael: What I've always wanted. A better world. Kip: How is it that you lost Dean? I thought you two were joined at the... everything. Kip: But it's like salt water taffy, or infants. I just like the taste. Kip: You are a damn legend, Sam. An icon. The shoulders. The hair. You are my Beyonce. Sam: That's what I thought. Jack: All I did was get punched in the face. Castiel: To be fair, we all got punched in the face.